I'm Jack, I'm 14, and my favorite flavor of ice cream is coffee coffee buzz buzz. I read Circle of Jinn and I picked it up because I had read the first book, Becoming Jinn, and I wanted to see how the series ended. Action-packed. Do hyphenated words count as one? I liked all the descriptions of the Jinn world. The first book was set in our regular world, so it was cool to see where the Afrit lived. I would probably find a way to remove my powers, so the Afrit couldn't track me and I wouldn't have to grant wishes. I already talked my brother into reading this, and to do that I told him it had a lot of action and fighting and a cool setting (and I left out any mention of the kissing parts)! I think it's pretty cool--I really like the color. How did she come up with the idea for this story? Lori Goldstein answered this question in an interview with Hypable. "Becoming Jinn is a modern spin on the traditional tale of wish-granting genies. The genies in my book are Jinn, which are magical beings derived from North African and Middle Eastern lore. As soon as I heard the name Azra, which was during a news report following an earthquake in Turkey, a character popped into my head. I didn’t know she was a Jinn right off the bat, but as I explored what kind of story I could build around her, I was drawn to one that would allow me to add touches from these other cultures." 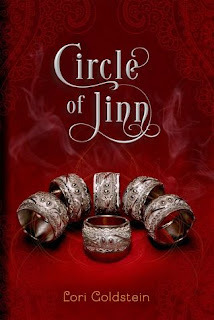 Thank you to Jack for sharing Circle of Jinn with The Kidliterati! In this dramatic sequel to Becoming Jinn, Azra’s story comes to a heartfelt and thrilling conclusion.